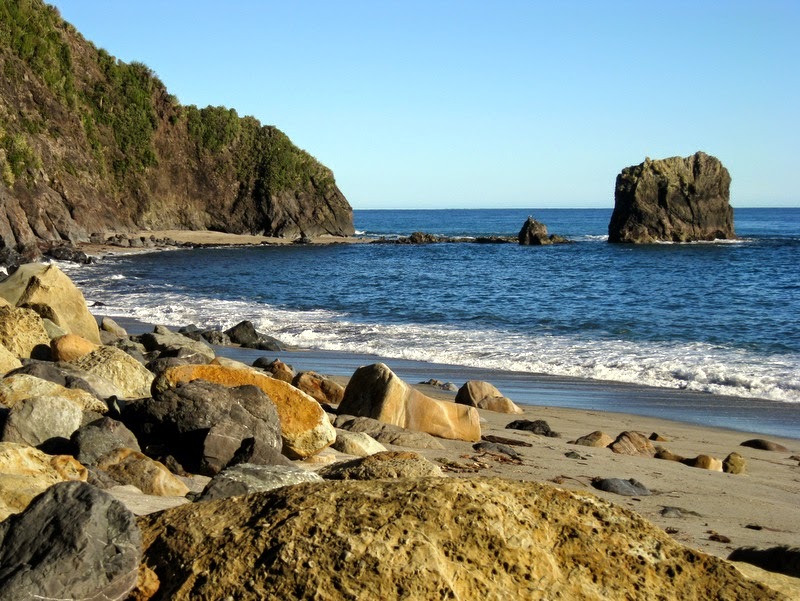 Last week we did a two day hike on the West Coast of New Zealand. This world heritage area is huge, wild and undeveloped. We spent day 1 walking through rivers and incredible rain forest. And day 2 we spent walking along the coast - boulder hopping, beach combing, rock pool splashing and watching seals and dolphins and all sorts of lovely sea birds. When I'm by the sea I can't help fossicking. By the time I got back to the car, my pockets were filled with little treasures. So, onto the next page in my 'In My Backyard' sketchbook with a marine background and lots and lots of shells drawn on top. I only have one rosebush in my garden and it is an unusual peach colour. When we bought our house 10 years ago the very large garden was pretty much empty. It had 2 native bushes, a couple of ornamental grasses, lots and lots of lawn ... and this rose bush. Since then we've planted a mostly native garden. Something that reflects our local landscape and is natural and, to be honest, a little wild. And this rose bush is still there. Every winter I vow I'm going to get rid of it and I chop it right to the ground. And every summer it grows like crazy and is covered in these wonderful smelling, unusual coloured, huge blooms. So I bow to it's stubborness and enjoy it. I pick the flowers and bring them inside. I even carefully remove the dead blooms to keep it flowering. I water it. I admire it. I'm so inconsistent! So, my tribute to my stubborn peachy rose today. Page two of my 'In my backyard' sketchbook. 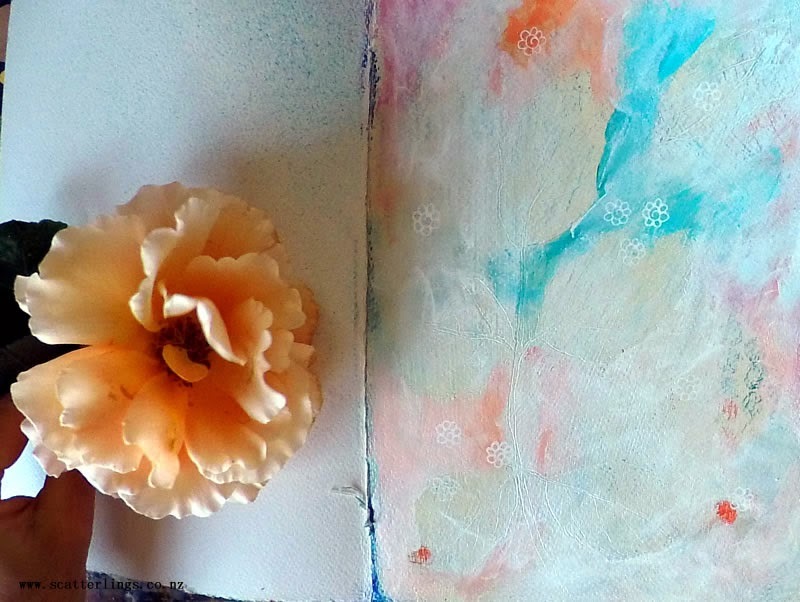 process photos of "my peachy rose"
I've started a new sketchbook I'm calling 'In My Backyard'. I aim to fill it with abstract, mixed media paintings and drawings inspired by the nature that surrounds my home here in New Zealand. My flatmate collected this awesome sprig of gumnuts. 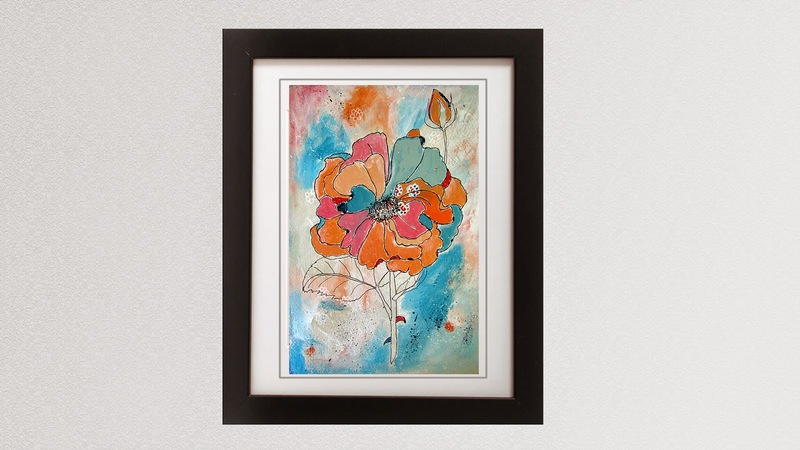 She has it hanging on her bedroom wall. I covet it. I do. But I can't have it, so I'll just have to paint it. And I've made my first art video! 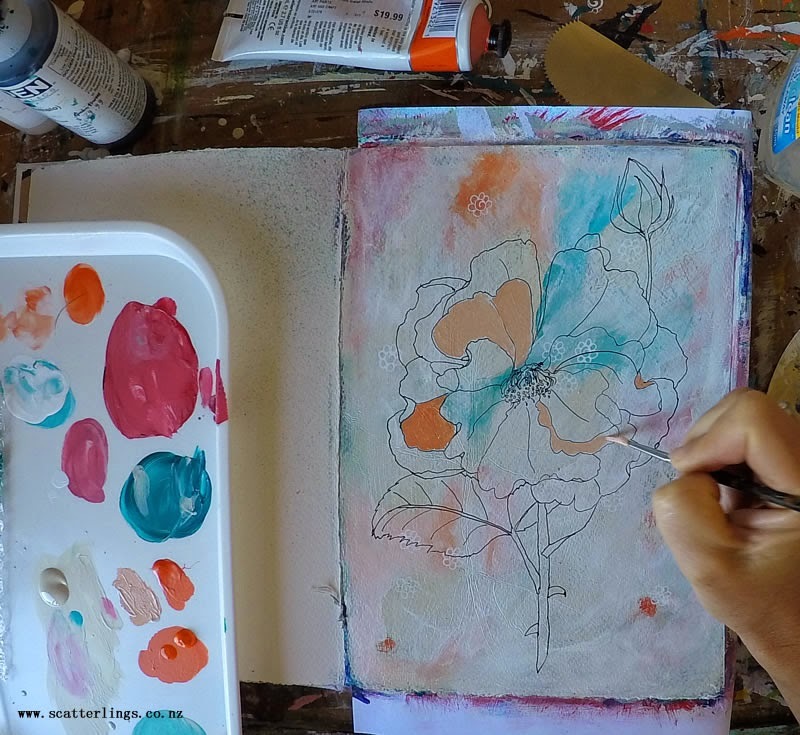 In it you can watch me painting this mixed media piece. 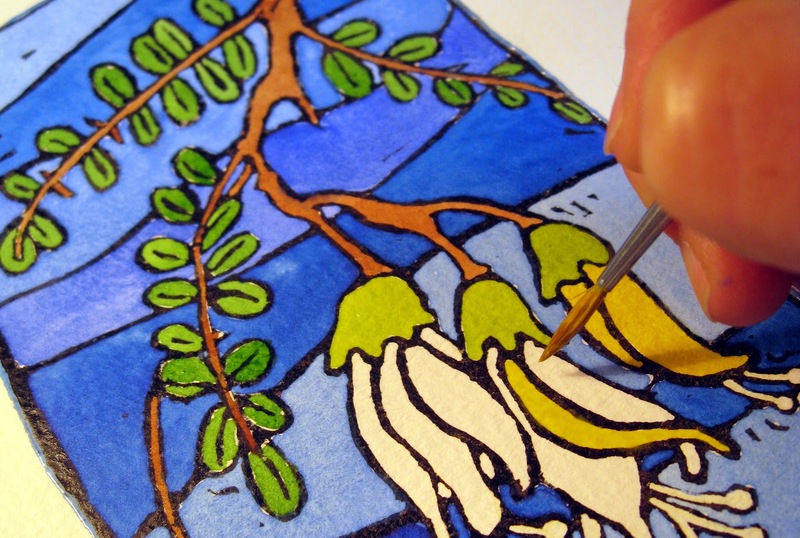 painting "gumnuts & gum leaves"
It's been several years since I've kept a blog, and this is my first time blogging about my art and art process. 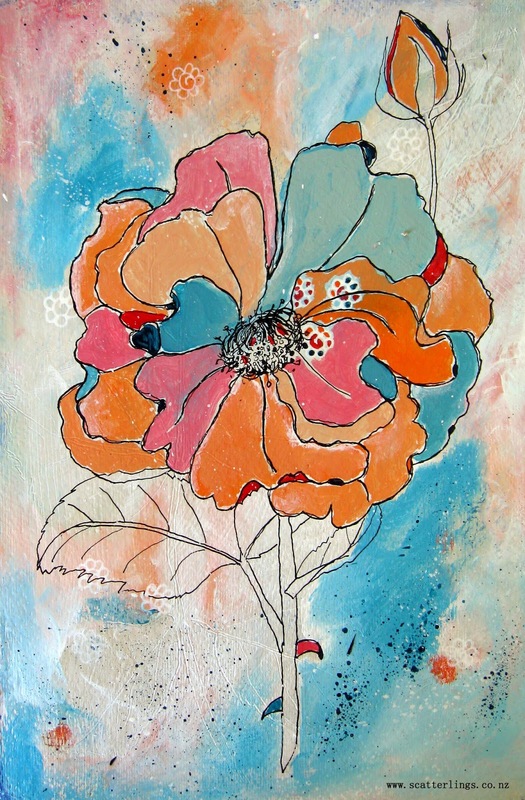 Up until now, for my art journey, I've been keeping everyone up to date on Facebook (www.facebook.com/art.scatterlings). 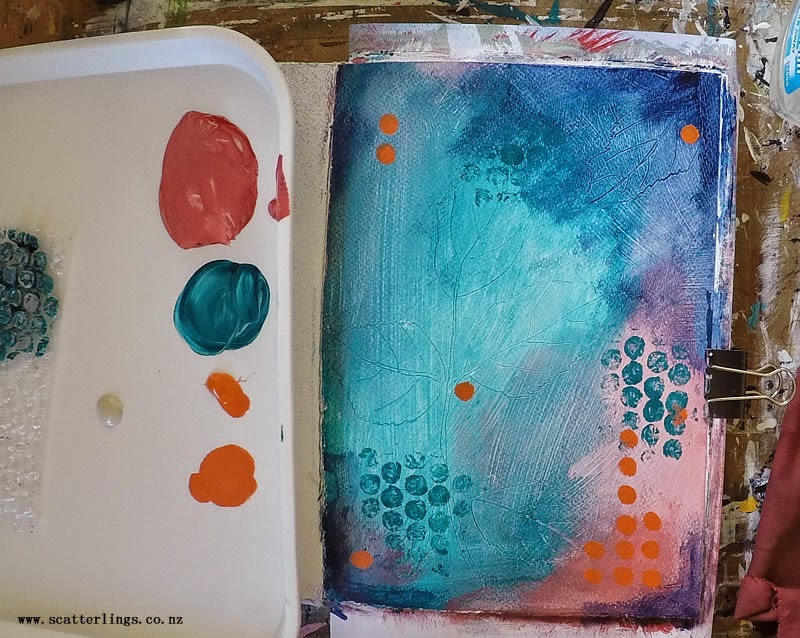 This works well for little snippets and photos and has been a great way to connect with those who are interested in my work in the studio and my sketchbooks while I'm travelling. But, lately, I've been wanting to share in more detail what I'm up to. Particularly in my home studio -where I create almost everyday when I'm not adventuring in the hills. I also realised that while I have a mountain of sketchbooks which document my travels over the last few years, and I've been quite good about dating my paintings and sketches over the years, I don't have one place I can refer to that shows everything. Hence a blog. A place to hopefully inspire others. And a place I'll be able to return to, to revisit my artistic journey and jog my memories. Since this is all new to me, if you have any ideas, requests, or comments, then please send them along. I'd love to hear from you.